The horse dream started when I was about 7 or 8 years old. We moved from the hills of City Terrace, California. We moved into the house in Pico Riviera leaving behind my beloved hills and above everything else, my Grandmother (Bertha Clark). That is when the Horse Dream began. I would fall asleep at night hoping the Horse Dream would come again. Many times I was disappointed when I would wake in the morning, because my beloved wild horse did not come for me. When the wild horse came for me at night I did not want to wake up because he would be gone again. Many times I would try to call it back during the day, as a way to go someplace safe and free. The older I got, the harder it was to call it back. I felt my freedom slipping away. 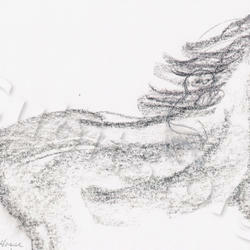 When Wild Horse came, while I was sleeping or awake, I was filled with great joy to see him again. We would talk, without sound words, by looking into each others eyes. His eyes were always filled with love and acceptance for the vulnerable little child before him. He would warn me when there was danger approaching. I would leap upon his beautiful strong back and he would run with the wind until we were hidden in the hills. From our hiding place we would watch the people that were sent to catch us and bring us back to their world, the world that we are told we must live in, the world where there is no time for the animals. We must grow up and learn not to hear the animals talking to us. They wanted the child to learn the ways of their world. They wanted to capture the Wild Horse because they felt he shouldn't be running free and teaching the child the ways of the animal world. In my Wild Horse dreams, he never allowed me to be captured by the people. As I became older his visits became fewer. Sometimes I would try to call him back, but I felt he couldn't hear me. I often wonder if he had been captured and was not allowed to talk to the little child anymore. I miss him. Sometimes I still try to call to him, hoping he can escape and come to me. We would run wild and free again. I still cry for my loss of the Wild Horse. When I allow myself to think of his love and companionship, I feel grea t sorrow for both of us. I miss him. Will he ever be able to escape his captors and return to me? I would love to run with the wind again, with his mane flowing around me, protecting my unclothed wild child's body. Where are you, Wild Horse, can you hear me? 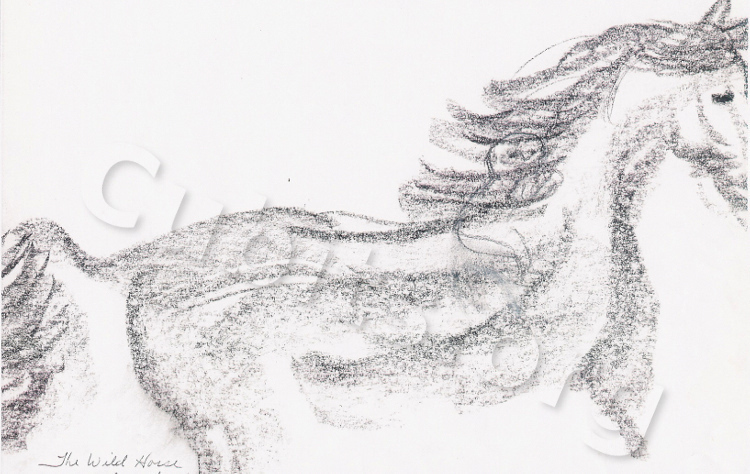 The drawing of the Wild Horse carrying the child was done by Valleylynn.